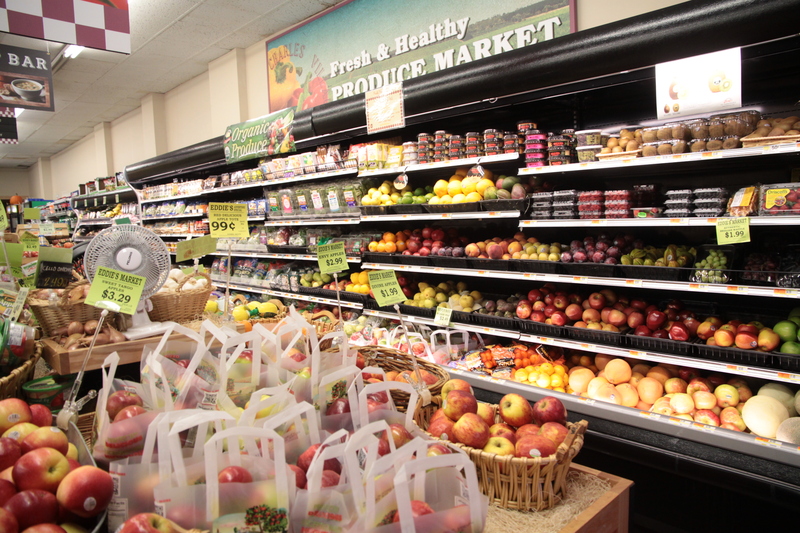 The price of produce such as strawberries is higher at Eddie’s Market. Students have the option to shop at a variety of grocery stores to best fit their budgets and tastes. Popular choices include the Charles Street Market (CharMar), Eddie’s Market and the Giant grocery store. However, the pricing and quality of the three stores are not equal. CharMar is the University’s own market and eatery. Students can use their Dining Dollars to purchase produce and shelved foods, as well as eat from the Crêpe Studio, a sandwich station, a Bamboo Café sushi station and a Meals in a Minute station. Because it is located so close to campus, students often cite CharMar as the convenient choice. Giant is located minutes away from Homewood at 601 E. 33rd St. Out of the three options, it is the largest and the only chain grocery store. It offers a wide variety of food and personal goods. Eddie’s Market on St. Paul Street is a closer alternative to Giant, smaller and more similar to a Trader Joe’s than a chain grocery store. Eddie’s offers several artisanal and organic options. The prices of 15 common student purchases, such as Nutella, Colgate toothpaste and a carton of strawberries, were compared among the three stores. Giant was consistently the cheapest option. Eddie’s and CharMar carried similarly priced items, but CharMar is often seen as the most expensive place to shop. rationale behind CharMar prices and said Dining is conscious that pricing is important to students. 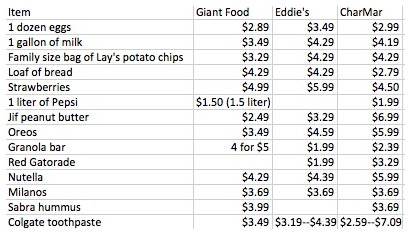 The table above compares the differences in price of common items bought at CharMar, Eddie’s and Giant. Connor also described the process the University uses to contextualize CharMar prices. Prices were generally more expensive at CharMar, where Oreos are sold for $6.99 as compared to $3.49 at Giant. Out of 13 comparable items, nine were most expensive at the market. However, Eddie’s sells eggs and strawberries at $3.49 and $5.99 respectively, representing a steep price jump over similar CharMar items. Although CharMar’s location is convenient, students like sophomore Carolina Chu do not think that this justifies its high prices. “I believe CharMar food is overpriced. I remember Andy Kim posting a picture of pancake mix from CharMar that was more than double [the price of] what they sell at the generic grocery store,” Chu wrote in an email to The News-Letter. Sophomore Victoria Gramuglia said that while she doesn’t shop for fresh groceries at CharMar, she thinks its meals, including crêpes and flatbreads, are too expensive for everyday consumption. While many students seem to think CharMar’s food is too expensive for its quality, sophomore Mia Berman said that a potential perk in the market’s offerings was that the store accepts students’ Dining Dollars, which saves her money. Senior Drew D’Avino explained his typical grocery shopping process in the context of CharMar prices. He lumps CharMar and Eddie’s in the same price range, but does say that for an upperclassmen living in the neighborhood, Eddie’s is convenient because of its St. Paul Street location. Softball article, JACQUI NEBER. Spending Dining dollars do not save students money as students must pay for them up front! Additionally, when students are spending dining dollars (DD$) there’s a premium. It costs USD 1674 to buy DD$ 350 dining dollars. Ask Ms. Pasternack for some help with dimensional analysis to convert the those dining dollar prices to US$ equivalent. It’s not a valid comparison! You should further analyze what % of volume is purchased with DD$ and adjust the prices accordingly!